The Jeep Wrangler soft top aftermarket is impressive. Jeep owners have so many different options to choose from, available from many different brands. Owners of the aftermarket soft tops have the same issues as owners of the factory soft tops – where do I put my windows when removed and how do I keep them from getting scratched? Even more-so when I want to take them along for the ride. Our Soft Top Window Storage Bag was designed with the stock Jeep windows in mind. It excellently protects the windows of Wrangler JK (2-door & 4-door), TJ, LJ, YJ,CJ. It will also work to protect many aftermarket soft top windows; the Rugged Ridge Exo-Top windows from our own SEMA Jeep Build, as an example, fit great! 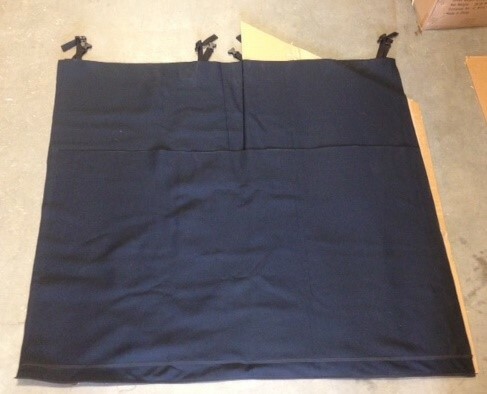 We are getting many inquiries as to whether our Window Storage Bag will hold the Bestop Trektop NX windows. The Trektop NX side windows are longer than the stock windows because they curve around the rear corners of the Jeep (the Trektop NX rear window size is very similar to the stock rear window size and therefore, not an issue). We were able to develop some cardboard templates of the Trektop NX Windows to evaluate their fit. You can see in the photo that the fabric portion of the window extends several inches past the end of the sleeve in both directions. The clear vinyl portion of window remains protected inside the neoprene pocket. The quick release buckle straps will still close around the sleeve when rolled up. It is important to note that the plastic piece that inserts into the window panels to keep their shape when curving around the rear corners of the Jeep will need to be removed before rolling the windows. 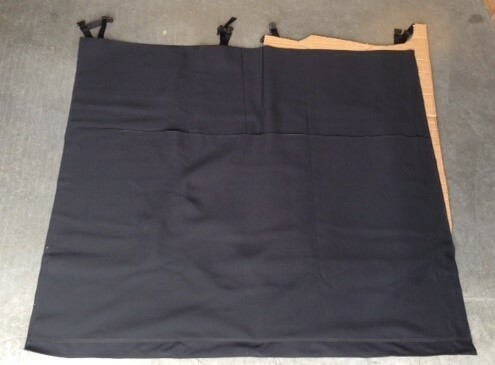 The plastic pieces can be rolled up in the center of the neoprene sleeve before it is inserted into the Storage Bag. Again, the fabric portion of the window will extend several inches past the end of the sleeve in both directions with the clear vinyl portion of the windows protected inside the neoprene pocket. We haven’t been able to get dimensions or test fit the Bestop Trektop NX windows for a JK 4-door or an LJ. However, we are assuming that the JK 4-door Trektop NX windows will fit our Soft Top Window Storage Bag as they are shorter than the 2-door model. The LJ is more of an unknown due to the longer length. We welcome any feedback from any customers whom have the opportunity to try these options out.